George Washington had five full siblings and three half siblings. His father Augustine remarried (Mary Ball) after his first wife died. George was the eldest child of that union. George was close to his half brother Lawrence who, when he died of consumption, willed Mount Vernon to him. Betty, his sister, is said to have strikingly resembled him. She married Fielding Lewis and when he died, much in debt, George undertook to do what he could for her and her children. George’s brother Samuel, two years his junior, gave him a lot of grief. Married five times he was always in financial difficulty. Exasperated, George wrote in 1781: “In God’s name how did my brother Samuel get himself in so enormously in debt?” Nevertheless George lent him rather large sums of money. 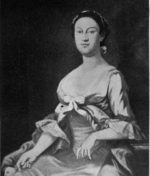 HARRIOT WASHINGTON (1776-1822) was one of Samuel’s children by his fourth wife whom George undertook to care for in 1785 after her father died and her stepmother remarried. Harriet was shuffled between relatives, living at Mount Vernon and with her Aunt Betty Lewis, Washington’s sister, from 1790 to 1795. George Washington was not too happy with Harriot’s behavior, considering her spoiled. She has “sense enough,” he told his sister, “but no disposition to industry nor to be careful of her Cloaths,” which are “(I am told) dabbed about in every hole & corner.” Sounds like a typical teenager to me. Harriot wrote several letters over the years to her uncle usually asking either for money or for specific items as in the following letter. Washington had assumed the office of president and was living in New York City with Martha and her grandchildren when Harriot penned this letter. Mt Vernon April 2d 1790I now set down to write to my dear Uncle as I have not wrote to him since he left this place I should have done it but I thought you had so much business that I had better write to Aunt Washington yet I am sure you would be very glad to se me improveing myself by writeing letters to my friend’s.